Handy Hints for Zello PTT users. Handy hints & tips for setup and use of Zello PTT app on Network Radios. The "Zello PTT walkie talkie" app is one of the most popular free 2-way simplex communications applications used on Network Radios and mobile telephones. Most Network Radio hardware is produced with various versions of the Android operating system but the Zello PTT app is also available for Apple iOS devices and Windows PC systems. ​The information and descriptions presented on this page were compiled using Versions 4.03 and 4.05 of Zello with screenshot images captured from an Inrico T320 handheld network radio running Android 7.0 OS and Inrico TM-7 network radio running Android 6.0. Other versions of Zello running on older versions of Android will look slightly different and may not have all of the features available on the latest version of Zello PTT app but the process of adding channels and operation are very similar. Newer versions of the Android Zello app have a blue 'overlay' circle at the lower right of the screen with a ' + ' symbol on it. This is used for adding channels, contacts and PTT buttons (depending on which screen/tab You are in) I personally do not use Zello versions with the Blue + circle as it gets in the way and limits workable screen space on devices with small screens. I have tried newer versions of Zello but always revert back to V4.05 as it reacts much faster and has lower latency than newer versions. V4.05 also displays profile and channel images correctly, newer versions display them 'cropped' into a small circle making many impossible to read properly. V4.05 is also the last version to display the 'Add' function at the top of the display (as seen on screenshots below) instead of using the annoying Blue + circle that obscures the Recents, Contacts and Channels lists etc. ​You may prefer using a newer version but I personally prefer V4.05 for speed, efficiency, and stability. When You create a new account on Zello take a minute to think about Your user ID/account name. The account name You choose is 'locked in' and can not be changed later. It makes sense to use a short account name like Your official licensed amateur radio callsign + name. Unlicensed radio enthusiasts can create a new Zello account using Your Name + Location or Your registered NR callsign. NR callsigns are entirely Optional. Unlicensed radio enthusiasts can use their registered NR callsign on the Network Radios channels. NOTE: Do Not set up an account with an NR number that has not been registered. Any account attempting to use an unregistered NR number will NOT be 'trusted in' and may be blocked from the channels. You need to register an NR number Before attempting to use it on the channels. To register an NRcallsign You need to call a moderator on one of the channels, - or - contact a moderator on the Network Radios facebook group. The moderator can check availability of specific NR callsign numbers and arrange registration. If You have more than one device You may find it handy to create a Zello account for each individual device. With One Zello account all the channels, contacts etc added to an individual account will be accessible on whatever device You log into that account from but You can only be logged in on one device at a time. if You are logged in on device #1 and You login on a second device, You will get automatically logged out of device #1. If You wish to have Both devices logged into Zello at the same time You will have to create a second account for the second device then add the channels and contacts you wish to use on that specific account. You may notice some operators using a -1 or -a suffix on their ZelloID / callsign when they are operating from their second device on their secondary account. Zello 'three dots menu' / Options / Audio. In the Audio setup menu You will find two sliders, the 'Playback Amplifier' adjusts the received audio level. The 'Recording Amplifier' adjusts Your transmit audio level (Mic Gain). I always 'un-check' the 'Automatic' boxes and use the manual sliders to set the levels on each device. 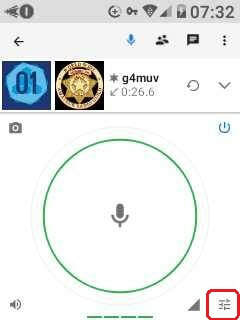 When setting up Your microphone and bluetooth headset or external mic audio levels it is best to go to Your 'Contacts' list and select the contact called 'Echo'. This will record Your test transmission and play it back to You enabling You to make fine adjustments and get clean audio at a sensible level without disrupting channels or calling on channels for an 'audio test' or 'mic check'. After each adjustment, go back out of the options and return to the 'Talk' screen (with the on screen PTT button) and make sure that when You transmit the 'LED bar graph' at the bottom of Your talk screen (below the on screen PTT button) does not go into the red at voice peaks. Try to set the 'recording amplifier' so that the 'LED bar graph' does not go above 3/4 of 'full scale deflection' and is always below the red. Just like any other radio equipment if You over drive the mic input the transmitted audio will suffer from 'clipping' become 'crackly' and hard to understand by other stations receiving Your transmissions. Holding the mic at a sensible distance from Your mouth is also important and with sensitive microphones do not hold the mic directly in front of Your mouth as this produces 'popping' and 'wind noise' as You speak. Using the channels with audio levels that are very low or very high makes it much harder for other operators to hear You properly and it is bad practice to operate with poor audio especially on Zello as the system provides excellent quality audio when the levels are set correctly. Note: The ECHO in Your contacts list is the only proper echo test facility on Zello. The Echo test facility is a 'contact' Not a 'channel'. If You see channels listed named 'Echo' or 'Echo Test' they are NOT the proper official Zello Echo test facility and should Not be used. The Noise Suppression function can be used to help reduce background noise when using Zello in noisy locations. This feature should only be use when necessary. In quiet locations the suppression function can cause distortion on Your transmitted audio. You must make sure Noise Suppression in the Zello app is turned OFF if You are using a wired or bluetooth headset, microphone or other audio device that has noise suppression, noise cancellation or speech processing features. These devices will work well with Zello as long as the Zello Noise Suppression function is turned OFF. Using such devices with the Zello Noise Suppression turned on badly distorts Your audio making it very hard for other operators to understand Your transmissions. The Noise Suppression function is also rather 'power hungry' it can slow down some devices an significantly reduce operating time due to increased battery use. For best results only use the Zello Noise Suppression function when absolutely necessary. This is a short tutorial to show the process of finding and adding channels on Zello. There are many channels available on the Zello PTT system with new channels being created every day covering a vast range of interests. The example presented below shows the process of adding channels that are part of the "Network Radios" suite of channels that has been mentioned recently in various publications including Practical Wireless, RadCom and Radio User. This specific group of channels mostly used by licensed Radio Amateurs but also welcomes unlicensed radio enthusiasts and people wishing to gain operating experience in preparation for taking their amateur radio exam. These channels are operated using a relaxed form of Amateur Radio protocols and radio etiquette, the channels are managed by a team of moderators who ensure the channels are operated to reasonable standards and any troublemakers are removed. The moderators and many knowledgeable operators also provide assistance to new users on the channels. There is also a special Events channel called 'Network Radios EV' (channel logo shows EVENTS) this channel is used for a variety of events including radio rally days, hamfest events and special discussion groups like the UK foundation licence support events and weekly Network Radios Net. Operators wishing to use the Network Radios EV channel for an Event should contact a Moderator with event details & times. any channels that have a different channel owner are Not part of the original 'Network Radios' group of channels. : NOTICE : Do NOT accept 'channel invites' from any channel that says it is part of the Network Radios suite of channels or any channel that looks like it is using the same graphics and/or description. Other channels that 'pretend' to be part of this channel suite by using our copyright protected channel logos or channel descriptions are doing so in direct violation of the Zello Terms Of Service. When a new channel is going to be made available as part of the official Network Radios suite of channels all current users will be made aware Before a channel is added to the existing channel list. We will make announcements on the existing channels, on the Network Radios facebook group and on this website Before any new channel is made available. :note. New versions of Zello have a blue circle 'floating' at lower right of screen to add channels. #3: You will be presented with a list of channels to choose from. Select the channel You wish to add. Note: The "Network Radios" group of channels all have the same style logo and are owned by G1YPQ. There are many other channels on Zello that have been created by other people with similar channel names and similar looking logos that are Not part of the original Network Radios Group. As You can see in image #3 above there is a channel listed as "Network Radios CH 0" with no logo and 1 user. That is an independent channel that is not associated with the Network Radios group of channels. ​Always check channel Owner is G1YPQ before adding the channel to Your account. #4: Read the channel description then Select "+Add To Contacts" or "Add channel" This will put the channel into Your own Channels list. #5: Select the channel, in this case Network Radios CH 02, You can listen to the channel but only Moderators can hear Your Transmissions until You are granted 'Trusted' status by one of the channel Moderators. - Please Don't add moderators or channel users as contacts expecting to get 'trusted' in to a channel. Just 'Key Up' on a channel and ask. #6: When a Moderator makes You a Trusted user, You will see a message briefly appear and the notification seen on Image #5 will no longer appear. You now have 'Talk Rights' enabling You to Talk on the channel and all other operators on the channel can hear Your transmissions. You may get 'trusted in' and granted Talk Rights on a channel without talking to a Moderator. if You are a Licensed Radio Amateur and You have used Your Callsign (or even better, callsign and name) as Your Zello account name, a Moderator can look up Your details online. If You have used Your registered NR callsign on your ZelloID Moderators can check NR callsign is registered and 'trust' You into the channels. Unlicensed radio enthusiasts who have listened and wish to join in may have to 'Key Up' and speak to a Moderator before being Trusted on the channel. (especially if You have not provided any information in Your Zello profile) If You are a radio enthusiast with an '11m DX group' callsign You can use that if You wish. When You have added each new channel to You channels list, make sure You 'switch on' the new channel. When one of the Moderators sees Your callsign/Zello ID/registered NRnumber listed on the 'untrusted users list' on each channel they will check Your Zello Profile information and 'may' decide to grant You trusted status on the channel without speaking to You if Your profile information is sensible or they can see You have already been Trusted on another Network Radios channel. If You have not been granted talk rights on one of the channels after a while.. You can put a call out requesting authorisation, this will alert the moderator team to let them know you are logged in and waiting to be granted talk rights on the channel. It may take a little time for a Moderator to spot Your callsign/Zello ID on the channels or return to Your call as they may be busy on another channel or attending to other tasks in the background. Please be patient, You will be attended to when possible. Attempting to join a channel or get 'trusted' status on a channel by adding a moderator to Your contacts Will Not Work. The "Contacts" list is for direct personal contacts only and has no connection with the "Channels" list or channel operation. ​ Any users with offensive user names, information or images on their Zello profile will be Blocked. in accordance with the Zello Terms Of Service and Zello Community Guidelines. Each time You login to Your Zello PTT app Your status defaults to 'Available' mode. When You have more than one channel in Your channel list and are in Available mode You will hear transmissions from all the channels that are switched on in Your list. This can be somewhat confusing when You are trying to have a QSO on a selected channel and You are receiving transmissions from the other channels in Your channel list between overs. You can set Solo mode by tapping the 'Three Dots Menu' at the top right of the screen, select STATUS and then select Solo. Now when You are in one selected channel You will only hear transmissions from other operators on that specific channel. When You go 'Back' out to Your CHANNELS list or RECENTS tab You will hear transmissions from all channels in Your channel list that are switched on making it easy to find which channels have activity on them. You may find it useful to get into the habit of selecting SOLO mode every time You start Zello. Still hearing transmissions from another channel when in solo mode. ? ​Some users found that while operating on one channel in Solo mode that they were automatically 'jumping to' another channel in their channels list. This makes it behave like a form of 'priority' channel mode causing transmissions from the channel that is set to default mode to be heard when operating in Solo mode on a different channel by automatically changing to the default channel when a transmission is received on that channel. ​This can be useful in some circumstances but most of the time just makes things somewhat confusing. How to check for and clear a 'Default Channel'. Go to Your channels list and look at the channel icons. ​To remove a Default channel setting..
Press and hold over the name of the channel that has the small triangle at lower left of its icon. This will display the command list as shown. this will remove the triangular channel marker and return the channel to normal operation. You can program multiple hardware buttons for use as PTT buttons in Zello. This example shows the PTT button setup process using Zello PTT V4.05 on an Inrico T320 Network Radio. Zello V4.09 and above also has the same functions but the +ADD BUTTON function is in a Blue Circle with + in it at lower right of the screen. ​You need to go into the "Options" menu by selecting the 'three dots' at the top right of the Zello app screen. 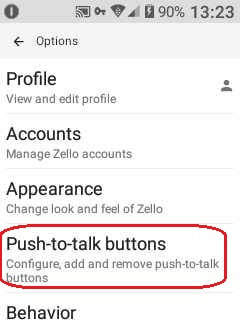 In Zello Options menu Select "Push-To-Talk buttons"
Select the +ADD BUTTON function. You can then press the hardware button You wish to program. You can set the 'Push-To-Talk button action' to operate as a normal 'Hold to Talk' or 'Toggle' as required. Use the 'Button contact' function to select the Contact or Channel You wish to transmit to with this button. With the new Hardware button page open, Use the Select... function on the "Button contact" drop-down menu to add a contact or channel from Your Contacts list or Channels list. * If You select a Contact the new button will Transmit directly to that Contact, not via a channel. * If You select a Channel from You channel list the new button will Transmit on that Channel and all operators with that channel 'switched on' in their channel lists will receive Your transmission. 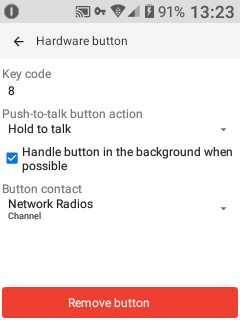 Use the 'Back' button on Your device to exit all the menus and You can now use the new programmed hardware button as a dedicated PTT button for the Channel or Contact You selected with 'hold to talk' or 'toggle' button operation as required. Note: I used this method to program the physical keypad number buttons on my own Inrico T320 as PTT toggles for a selection of individual channels and contacts. 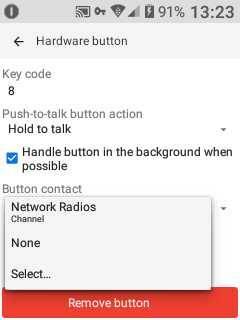 Make sure Bluetooth is switched ON in Your Android settings and the Bluetooth device You wish to use is 'Paired' to Your Network Radio. Follow the same process as for a hardware PTT button until You select the "+ ADD BUTTON" function. 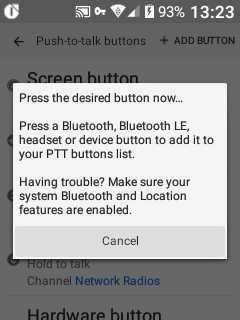 When prompted to Press the button You wish to use, Press the PTT button on the Bluetooth device. If the button appears as a new button in the list then continue to set it up as shown above. If You press the Bluetooth button and it does Not appear in the list this means the Bluetooth device may not be supported as a PTT button device by Zello and cannot be added and programmed as a PTT for Zello. There are a vast selection of Bluetooth media buttons, selfie buttons, camera shutter buttons and PTT buttons commercially available with a variety of different Bluetooth implementations. Some will work with Zello and some will not. ​It is best to confirm with the seller (or with another Zello user who has used the specific device) that it does work with Zello as a PTT button device before purchase. NOTE: This works with the Paid version of Button Mapper only, The Free version of Button Mapper does not allow the 'broadcast intent' feature. On the TM-7(plus) and TM-8 you can map the P1/2/3/4 buttons to go to a channel in Zello (and possible also contacts). Can any Network Radio operators who use the Paid version of button mapper on other network radio devices (TM-7, T320, RT4, SenhaiX N60 etc) please try to set up hardware button(s) on Your device using this method and let us know if it works for You. please contact a moderator on the channels and let us know if this method works on Your Network Radio devices. ​Thank You for Your assistance. Improving screen visibility in daylight. The Default Zello theme is 'Black' as seen on the TM-7 screenshots on this page, which can be hard to see in bright daylight when operating outdoors. Turning the screen brightness up does help a little but this uses more power, depleting the battery faster reducing operating time. Go into the Zello Options menu, accessed via the 'Three Dots' at top right of the Zello screen. In the Options menu, select 'Appearance' and change the 'Theme' to White, This improves readability in daylight without needing to crank up the screen brightness, You may even be able to reduce the screen brightness which reduces current consumption and extends the battery operating time. 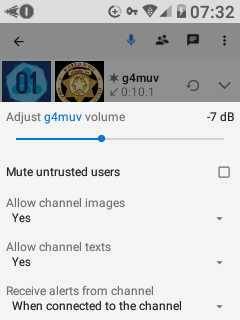 Receive Volume Adjustment for Individual Stations. As Zello is used on a wide range of devices with different microphones and headsets, You will find that some stations are louder or quieter than most others. Instead of constantly adjusting Your main volume control during operation You can adjust the receiver gain for each individual station to bring their audio level in line with everyone else. While receiving a transmission from a station who's audio is louder or quieter than others, You can adjust the level for the specific station by selecting the 'settings' button at lower right of screen. The slider lets You adjust the audio volume for the selected station. This setting is stored on Your device and used every time the specific station is received. Note: You can also adjust Your receiver volume level for individual stations using the volume slider on their Zello user profile. ​You can access each users profile page by selecting the profile image beside their user name on channel user listings. There is also quick shortcut to adjust the receive volume for individual stations. Hold your finger on the screen beside the on screen PTT button while receiving from the station You wish to adjust receive level on, drag your finger into the PTT button area and rotate clockwise / anticlockwise to adjust the volume for the station You are hearing. ​The default settings on the Zello PTT app can become annoying with various tones, beeps and vibration 'buzzy noises' going off all the time. Audio alerts and the vibrate 'buzz' alerts can all be turned on/off in the Alerts menu in Zello Options. Alert tones can often be heard when stations are transmitting, these alerts are often very loud 'on air' and many alerts are best turned off. Custom tones are available to download farther down this page if You wish to use them. If You do not want to use Custom tones simply set the Alerts shown below as Custom to Default and it will use the standard Zello tones. It is easy to send other operators You have spoken to on the channels a 'contact request' so You can add them to Your private Contacts. You will have to wait for the other user to respond to the request. If the other user Accepts Your request they will appear in Your Contacts list and You will appear in their Contacts list. By selecting a user in Your Contacts list You can communicate with them 'direct' for a private One-to-One QSO without using a channel. It is good practice to actually make contact with someone on the channels and ask before sending a contact request as many operators do not accept unsolicited contact requests and will treat them as junk mail or spam with either the Decline or Block functions. It is also worth noting that some operators will have the 'receive contact requests' function turned Off and will not receive any contact requests sent to them or get any notification that someone has sent a contact request so it is always best to ask first. NOTE: Attempting to join a channel or get 'trusted' status on a channel by sending a contact request to a moderator Will Not Work. To be trusted on a channel You need to have the channel turned ON so Your User ID is visible in the 'untrusted users list'. A moderator can then look at Your Zello profile information. They 'might' decide to give You trusted status without speaking to You if Your profile provides sensible information. Any users with offensive user names, information or images on their profile will be Blocked. ​You will need to set these according to Your own requirements. The "Keep Alive Interval" is a delay timer that sets the number of seconds between 'connection checks'. This changes the frequency that the Zello app sends 'Keep Alive' data packets to the Zello servers keeping the connection active. Reducing the Keep Alive Interval increases the frequency of sending 'Keep Alive' packets. This effectively holds onto the data connection more often which can help make your connection more reliable when operating mobile, this can be especially useful when travelling at speed in a vehicle. ​ Increasing the Keep Alive Interval reduces the frequency of 'keep alive' packet transmissions and can very slightly improve battery life, but this can have an adverse effect on connection stability during mobile operation. For more information on features and functions of the Zello PTT application on all platforms visit the Support section of the Zello website. Users who violate the Zello Terms Of Service will be blocked from the channels. Users who ignore the Zello Community Guidelines will be dealt with accordingly.